If you like stuffed peppers, but are looking for a healthier grain, rather than white rice, Brown Rice, Quinoa, or Bulgur, are great substitutions. 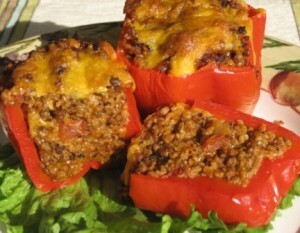 Today I will share a recipe I recently tested, and loved, for Stuffed Peppers with Bulgur and ground turkey. Ever since my Fat Smash Diet experience, I am really paying more attention to my eating style, and into wholesome foods. I still use white rice, breads and potatoes, but periodically try to alternate with other healthier substitutions . I also realized that I stuff lots of the foods I prepare, such as cabbage rolls (holubtsi/golabki), chicken breast, Green Peppers, beef, varenyky (pierogi), and many other ones, which I have not posted yet. I guess it creates a more filling food item, almost like having a whole meal in one, and adds to its presentation. Don’t you agree? Put 1 Tbs. of olive oil in a large skillet, warm it up. Place the ground meat into the skillet, and brown it up (about 10 minutes), stirring frequently for even cooking. 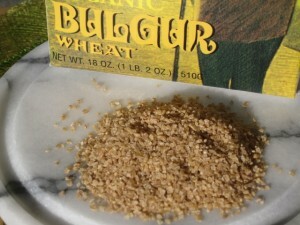 Add the bulgur to the meat, and sauté until browned (about 10 minutes), stirring frequently, to prevent burning (the bulgur wheat makes a lot of crackling sounds, while cooking). Add the onions, garlic, tomatoes tomato sauce, oregano and Worcestershire Sauce. Add the water, cover the saucepan, and simmer for about 15-20 minutes, until all the water is absorbed. Uncover, and mix in 1 cup of Cheddar Cheese, until melted. Prepare the peppers by, removing the tops and seeds. You can use whole peppers, but I sliced some of my peppers in half, lengthwise, and used only the bottom half of the red pepper (as these were very long). Fill a medium pot with water (enough to cover the peppers – about halfway full). Bring to boil. Place the peppers in boiling water and cook for 15 minutes. Remove from water, and drip off any excess water. Place peppers in a casserole dish. 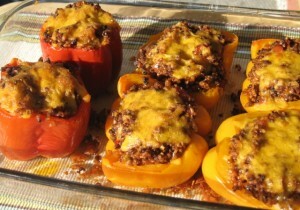 Sprinkle the remaining Cheddar Cheese on top of each pepper. Bake peppers, uncovered, on the middle oven rack, for 20 minutes.